July 11, 2012 - Hawker Beechcraft Defense Company (HBDC) announced it has entered low-rate initial production of its Beechcraft AT-6 light attack aircraft at the company’s facilities in Wichita, Kan. The company initiated low-rate production in response to significant indications of interest around the world for the AT-6, the most capable, affordable and sustainable light attack and armed reconnaissance platform. The AT-6 is a multi-role, multi-mission aircraft system designed to meet the spectrum of needs for the light attack mission. Leveraging a range of highly-specialized but off-the-shelf capabilities, the AT-6 is outfitted with state-of-the-art equipment such as a Pratt and Whitney PTA‑68D engine, CMC Esterline’s mission modified Cockpit 4000, Lockheed Martin’s A-10C-based mission system and L-3 WESCAM’s MX-15Di sensor suite. The aircraft has successfully demonstrated high-end net-centric and light attack capabilities and full compatibility with U.S. and NATO Joint Terminal Attack Controller systems during the Joint Expeditionary Force Experiment 2010, the Air National Guard Operational Assessment, and capabilities demonstrations of precision guided weapons conducted between 2010 and 2012. The AT-6 leads the light attack market with purpose-built capability, affordability, sustainability and interoperability for the most demanding of scenarios. 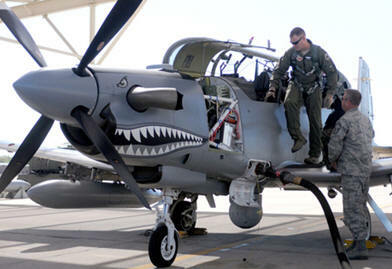 The AT-6 is currently under review as part of the U.S. Air Force Afghanistan Light Air Support competition. In June, HBDC delivered its detailed response for the competition to Wright-Patterson Air Force Base, Ohio.